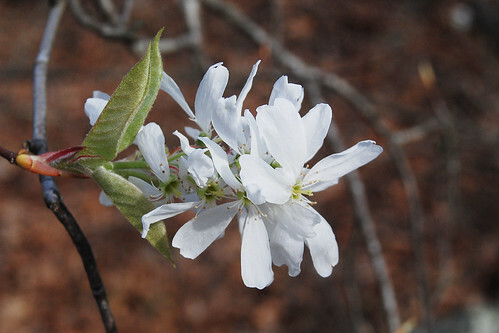 Flowers of Downy Serviceberry are a common sight in the gray, leafless forests of early spring in the Ozarks. I love how the flower clusters of Downy Serviceberry have thin and strippy petals. 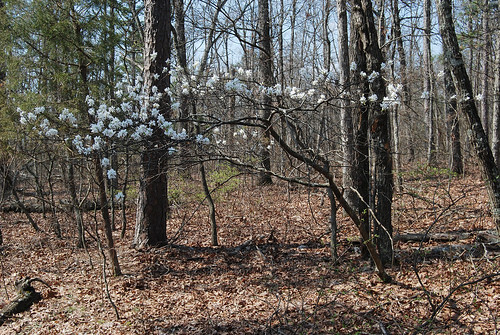 The flowers of the Serviceberry, also known as the Shadbush, are sort of shaggy and ragged looking, with petals that hang down a bit. The flower clusters are a couple inches across and pure white. The overall look of the tree in the bare gray forest is one of drifts of white, almost like clouds. When the sun breaks through and shines on the tree, it can be quite spectacular. 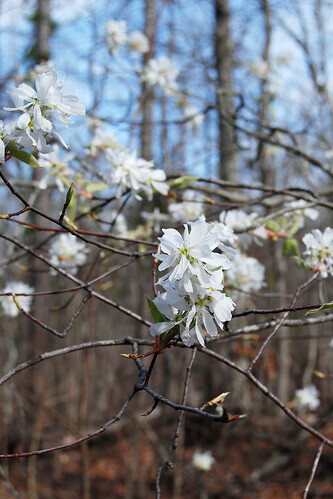 See how the flowers of the Downy Serviceberry Tree create drifts of white in the gray forest of early spring. Picture taken at Bell Mountain Wilderness in March 2012. The tree makes tasty berries that the birds always get to first, but if you’re lucky you can get enough to make a pie or jam. The old time locals refer to this as “Sarviss Berry”, and in fact that’s the first name I ever knew for it. Read about it here on the MDC site and there is another good article Virginia Tech. Dendrology.